VANCOUVER - Outgoing New Democratic Party Leader Adrian Dix says he doesn't plan to play an active role in the race to choose his successor, but less than 24 hours after announcing his decision to step down, he suggested the NDP should stay true to its left wing roots and be wary of attempts to liberalize the party to win elections. "There's no need for a second Liberal Party," said Dix. "We don't need a second party that is compulsively self-absorbed and really doesn't have any agenda for the key issues in provincial jurisdiction. We need an NDP." 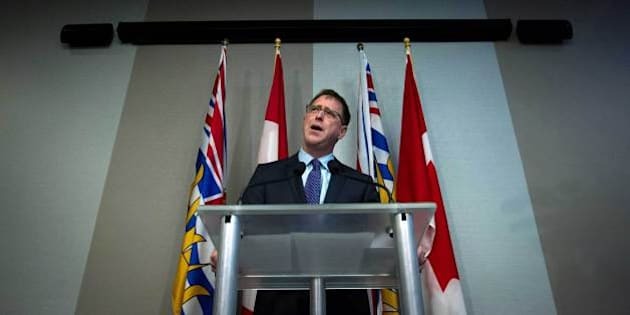 Dix made the comments following a speech to the delegates attending the annual Union of B.C. Municipalities convention, a gathering of the province's municipal leaders that is generally viewed as one of the largest and most important political events of the year. As Dix urged the NDP to consider a left wing polishing rather than a makeover, others were preparing to tackle major rifts within the party head-on, while the political machines of prospective leadership candidates were being primed. New Democrats John Horgan, Mike Farnworth and George Heyman are said to be actively considering running for the NDP leadership. Vancouver New Democrat David Eby, who defeated Premier Christy Clark in the May election and forced the premier to run in a byelection in Kelowna, is also considering entering the race. Some New Democrats attending the convention were also musing about potential dream candidates, naming federal B.C. New Democrat Nathan Cullen and Mary Ellen Turpel-Lafond, B.C. 's independent representative for children and youth. B.C. Federation of Labour president Jim Sinclair said he views both the search for a new NDP leader and the time before the next election in 2017 as an opportunity to build bridges between the party's labour and environment movements. Dix received a standing ovation when he told the UBCM delegates the Opposition NDP will press the largely absent Liberal government on key issues that are of concern and interest to regional communities, especially those who are under-served by the Liberals in rural and remote communities. After the speech, Dix said the NDP should seek to modernize its current political path and stay away from detours leading right or towards the centre. Some New Democrats and others from outside of the party have said the NDP's devastating spring election loss to Clark's Liberals signalled a political shift to the centre is needed. "We need to be proud of who we are and what we stand for, and we have to adjust, I think, our answers to the realities of these times, which are in some cases new and challenging realities," Dix said. He said the NDP needs to go through a readjustment period but should not consider dropping its core values that consistently bring the party about 40 per cent of the popular vote in provincial elections. Dix said the goal of the renewed NDP should involve keeping its traditional voter base, while still developing new, solid ideas and policies that can bring in the magic extra five per cent of voters who can catapult the NDP to power in the next election. "You've got to address, and be, something that people want and are attracted to," he said. "Yes, we've lost a lot of the last elections, 19 of the last 22 to be exact." But despite the lengthy losing record, British Columbians continue to support the NDP because they see themselves in what the party stands for and seeks to achieve, he said. "We have to continue that and get a little better at that," Dix said. Sinclair said the coming months and Dix's departure will give the NDP the opportunity to forge stronger ties with the environmental movement and will give voters time to see it's not necessary to choose between jobs and the environment. "We have to be very careful to not put people in camps that are black and white," he said. "We have to find a way through this environmental crisis and economic crisis people are facing. I don't think the party can have environment going against labour and labour against the environment. It's important to sort our way through this discussion." Eby said he considers resolving the conflicts between environmentalists and the labour movement one of the most important issues facing the NDP. "The issue of connecting the environment and jobs, it's the big challenge of our time, but it's the big challenge for the NDP," he said. "I think it's the future of our party. It's the lesson of the last election." Eby said that election lesson came down to jobs and the economy and the NDP needs to improve how to link jobs and the economy to one of the key values of British Columbians: the environment. When the shock of the outcome of the May election had worn off, New Democrats began to publicly question the party's strategy during the campaign. In particular, Dix's decision mid-campaign to oppose the proposed expansion of the Kinder Morgan pipeline — a move Dix admittedly said was made with little consultation within the party — was heavily criticized as a job-killer by some in the labour wing of the party. As well, Dix was strafed privately by party insiders frustrated with his staunch refusal until very late in the campaign to respond in kind to the Liberals' relentless attack ads. Dix told the UBCM delegates, he believes his decision to stay on the high road during the campaign rather than attack the Liberals, will pay future dividends as voters will respect the party. Dix said he hopes a leadership vote will be held no later than the middle of next year and that he'll retain his Vancouver-Kingsway seat and run again while doing everything he can to support the new leader.